For those who love quietness and living in harmony with nature. A few minutes from the attractions and services that the area offers in the summer, at the gates of the popular Costa Smeralda, full of beautiful beaches with white sand and crystal clear sea and internationally renowned tourist center. Immersed in the peaceful and amazing hill of Maricosu in Cugnana, surrounded by the typical natural vegetation of the place, with a large park, just 500 m from the coast road that connects Olbia, Porto Rotondo and Porto Cervo. The dependance (annex), even if located in a wing of a large villa, is totally independent, very secluded and quiet, with private entrance and parking. Recently renovated, it is furnished with attention to detail to make you feel at home. Includes a very large bedroom with double bed; living room; a wardrobe room; a well-equipped independent kitchenette; a large bathroom with tub and shower and a bathroom with toilet and bidet; air conditioning; TV; WiFi; barbecue; a veranda overlooking the garden where you can dine outside; an inner courtyard with deckchairs and umbrella and a terrace where you can sunbathe in privacy or have a drink at sunset. The large park with garden is well equipped and mantained and enjoys the natural vegetation of the place, rich in mastic trees and ancient olive trees, where you can spend relaxing hours sunbathing on the loungers, lying on the hammocks in the shade or admire the stars at night, enjoying the music and perfumes of nature. You will be most welcome, assisted in the best possible way to make you spend a pleasant holiday. It is necessary to have a means of transport. We are always easily reachable nearby or by phone. In case of need in the basement apartment located on the opposite side of the villa you can find the keeper. Hello, I am Rita and in summer you can find me here at the Case di Maricosu together with my daughter Federica and Franco, my partner for 25 years. 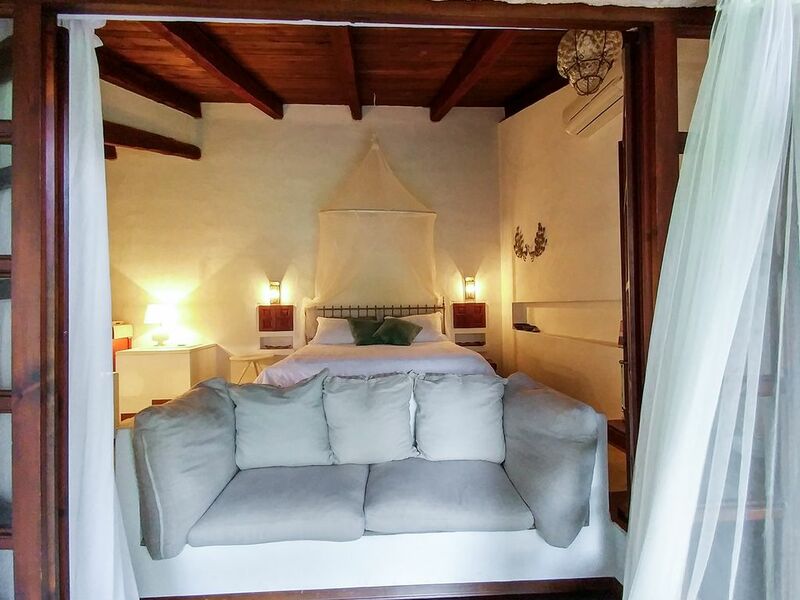 This is our little paradise, a place to spend your holidays totally immersed in the peace and splendor of the homonymous hill, surrounded by the quiet and the many centuries-old olive trees, a stone's throw from the most beautiful beaches and coves of the Costa Smeralda. When I'm not in Sardinia I live in Rome, my beautiful city. My passions are many, from that of vintage and recycling, with which I develop installations and furnishings, to painting, from naturopathy to classical dance. I love animals, I love life and I try to do my best to respect the universe. An enchanting place, well kept but at the same time respecting nature, ideal for those who feel happy and lucky to see a turtle or a blackbird and not be alarmed at the sight of a gecko or an anthill. Ein schönes Ferienhaus mit großem , gepflegten Garten und sehr netten und hilfsbereiten Vermietern . Gracie !! Sehr gemütliche, ruhige Wohnung mit super Garten. Die Vermieter sind sehr freundlich und unkompliziert. In der näheren Umgebung hat es sehr schöne Strände, sogar einen Hundestrand. Wir und unser Hund haben uns hier sehr wohl gefühlt und kommen gerne wieder. Casa molto bella e perfetta per una coppia, posto bellissimo e immerso nella natura. C’è tutto il necessario nella casa ed è in una posizione molto vicina alle spiagge e a Porto Cervo. Disponibilissimi i proprietari, insomma è stata una bellissima vacaza. Sicuramente da consigliare. Das sehr schön eingerichtete Ferienhaus liegt zentral und viele Strände können gut mit dem Auto erreicht werden. Die Küche ist klein, aber zweckmäßig eingerichtet. Wir hatten ein paar Probleme mit dem Wasser, sowie dem Boiler. Aber alles wurde schnell und erfolgreich von unseren Vermietern behoben. Der Garten ist sehr schön und lädt zum Verweilen ein. Leider sind die Autos von der Straße leicht zu hören. Alles in Allem ein schönes Ferienziel mit nettem kleinem Ferienhaus, sowie immer erreichbaren freundlichen Vermietern. It is the ideal base both for those who love the sea and the glittering social life of the coast, but also for those who prefer to go hinterlands to discover traditions, festivals, handicrafts and natural wonders. Despite the secluded and quiet location, all the points of interest of the area, beaches, towns, little villages, tourist resorts, attractions, are easily and quickly reachable. A means of transport is needed. The parking is near the house and private. The nearest ferry ports are Olbia (10 km) and Golfo Aranci (9 km).